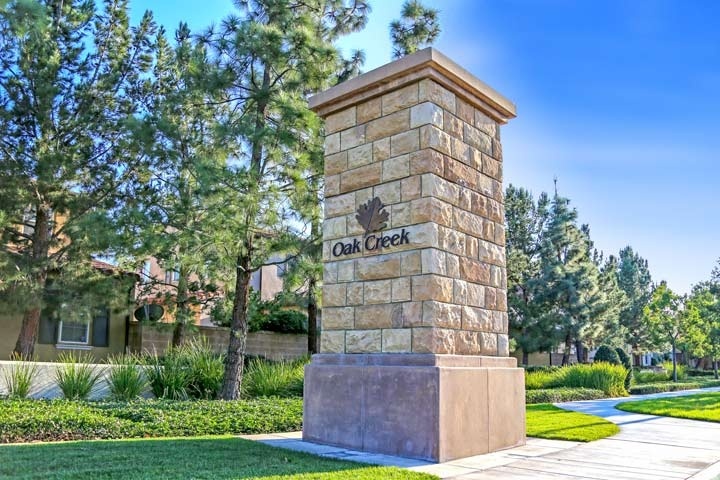 Oak Creek homes are located in the coastal community of Irvine, California. The Oak Creek neighborhood is ideally located near the 405 and 133 freeways and was mainly built between 1999 to 2004. There is a nice variety of residential one to four bedroom condos that range in size from 662 to 2,100 square feet of living space. Oak Creek also features two to six bedroom single family homes that range in size from 975 to 3,615 square feet. Select homes will be located in a gated community with attached garages, central air-conditioning and vaulted ceilings. The Oak Creek community is under a homeowners association with monthly dues required. Oak Creek is a master planned community with resort style amenities which include a large community pool, clubhouse, spa, tennis, basketball court, parks and barbecue area. This is a prime location near location schools and shopping at the Irvine Spectrum. Below are the current homes for sale and for lease in the Oak Creek neighborhood. Please contact us at 888-990-7111 for more information on this community and any of the homes listed for sale here.